I ended up at LBS on a whim, my friend Jayson & I had originally planned our evening at the Yard House but the wait was almost an hour long for the two of us. That is when we remembered we both hadn’t been to LBS yet and so off we went. The restaurant has a grudge bar feel with a mix of lace, exposed brick and a license plate flag on the ceiling. The menus are nicely designed, one page attached to wood almost like a clipboard. What is offered is exactly what you would expect burgers..mini burgers, build your own & signature burgers. 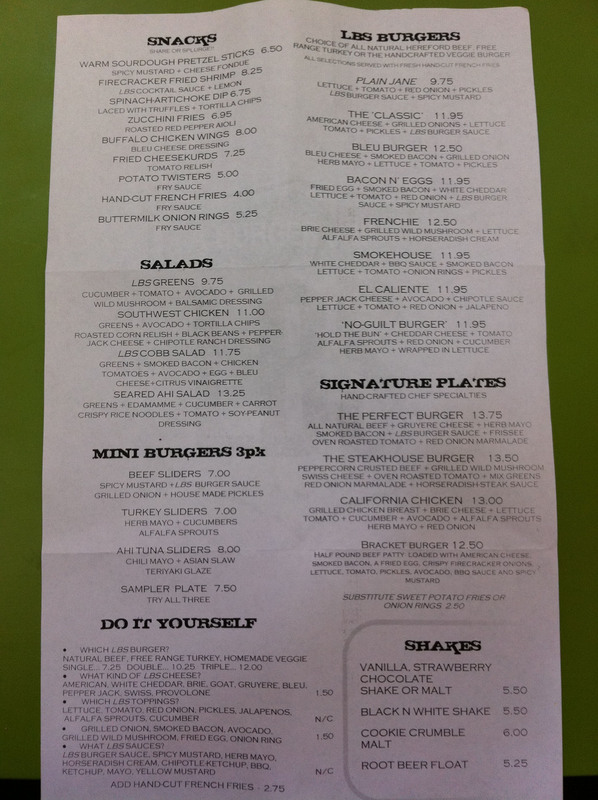 Below is a photo of the take out menu which is a copy of the original in the restaurant. I went for the bleu burger without tomato on a wheat bun (you get a choice of white or wheat) and shoe string fries. You can upgrade to onion rings or sweet potato fries for an extra $2.50 charge. Jayson had the classic burger on wheat with shoestring fries. The burgers were nice and thick, a good 1/2 inch at least and oh so juicy. I could have used more bleu cheese because I could barely taste it, but I love blue cheese so for me I want to taste it. The fries where nice and crispy and were served with LBS burger sauce which tasted like a spicy ranch. 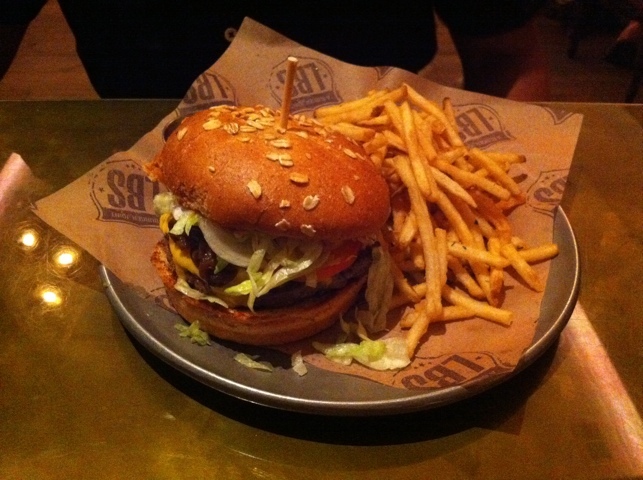 Jayson said his was just as good and that the meat was seasoned well, which for him is important when eating a burger. My burger on top & Jayson’s on the bottom. The service was a little spotty our waitress seemed to have better things to do than actually interact with us. The place isn’t that big and the other waiters seemed more friendly than ours. But I wouldn’t let this hold me back from coming back, over all the food did out weigh our waitress’s bad mood. And this is why I gave them 4 out of 5 stars. 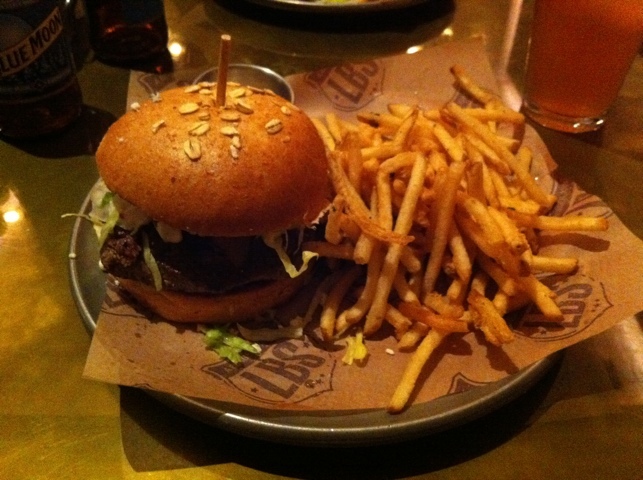 If you are in the red rock casino and craving a burger I would definitely recommend the place. Our total bill was $39.43 w/out tip and this included 2 blue moons @6.50 ea and our 2 burgers. So based on an average dinner out this wasn’t too bad. Especially since the burgers were very tasty.